This is a very hard post to write. If you aren't involved in my life, you may want to skip it entirely. I am mainly writing it here so I don't have to type it or another version of it in several places. I have been almost nonexistent in all of my pages, etc on the computer. Most of you know I was in a motorcycle accident December 5 that has put Hubby and me out of commisson. Ir has done more damage than physical. We are both an emotional mess as well. Coming to the realization that nothing will ever be the same is hard. Couple that with other extenuating life factors and we both have become severely depressed which makes it even harder to do anything or get things done that used to be easy. I was forced to go back to work to keep my insurance paid. While hubby has the VA to rely on and can get most medical done there, without insurance, I am in a heap of trouble. My prescriptions for my fibro, hbp, rls, gerd, etc.... are over 2000.00 a month if out of my pocket. Work is not going well on 2 different fronts. I am not able to walk or stand well and my job has continual standing and walking and carrying heavy boxes. We are also being looked at for a buy out and the new company, if it takes over, means that I would lose my insurance and my retirement (4 years to state retirement with my 80 points) regardless of wheter they decided to take me on or not. Which now is probably a not with my "handicap"
My main family support was my Dad. In the middle of this, he moved 1300 miles away and so I lost that. My Daughter has a new boyfriend and so her calls and texts have become less frequent. The rest of my family is so scattered around the country, that they were infrequent support anyway. My house looks like a war zone and the outside looks like the house has been abandoned. With my ankle so badly screwed up, pulling weeds and cleaning is difficult at best and very painful at worst. Looking at the mess everywhere doesn't help my mood and is pushing me deeper into depression. When dad moved, a lot of things got given to me and are piled up inside and outside ( rocks, tumblers, etc) for me to go through and use or find homes for. The doctor says I have 3 more months of healing and if I still have problems- it keeps "catching" - I will be looking at more surgery and time off work. If that happens, there is a strong possibility that my job will be over as I have no more FML (family medical leave) That is, if the other company hasn't already taken over and sent me packing, or theUniversity hasn't already terminated me. I managed to do the sand and sea blog - barely. 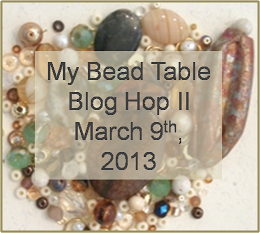 And am going to attempt to honor my commitment to the bead soup blog hop this weekend if it kills me.... But I have goten way behind on my destash. Making 2 trips to the Post office for each ( need weights to determine postage cost)became too daunting as all I can do from home is the small priority box and most orders would be lost in that "big" box considering the size of their orders.please be patient while I sort it out. If you are a praying person, I could use all the prayers you can. I have never in my life been this discouraged and depressed. Hey, Annette, I had to give some thought to whether I should respond to your post, it is so personal and we don't know one another except as fellow lovers of beads. Let me say firstly that you can definitely count on me for more prayers. For you, I'll pray for the same things I ask for myself: the strength to take that next step on a path that seems dark and scary, the courage to seek out any help I can get, and the discernment to recognize when it is time to let go of whatever is holding me back. I won't pretend to understand the desperation you are feeling with your medical/work situation, Annette. But I can fully empathize with your depression. Mine stems from a completely different place, mental health issues with two of my sons. I agree that feeling we are in a hopeless place can be completely overwhelming and bring life to a crashing halt. Are there any organizations in your area that link volunteers with folks in need of help, like with housework or yardwork? Any second-hand shops that would pick up items and pay a flat amount for the whole lot? Do you have any acquaintances at your church that could help you connect with volunteer helpers... how about a pastor or hospital chaplain? Hospital social worker? Can you be referred to Red Cross or other organization via your M.D.? Well, I hadn't meant to go on so long, Annette! Please be assured I will keep you in my thoughts and prayers. If you can find the motivation, please take out your Bead Soup and keep it with you while you have your ankle up for treatment. Just touching and dreaming about those beautiful beads (love that owl) may compel you to put a few together. You got a nice boost when you did your Sand and Sea blog hop earlier this month. I bet it was hard to get going (ask me how I know!) but so soothing once a piece starts to come together, right? I know you will enjoy this next blog hop, too. If you are like me and find the photo-taking the most challenging aspect, do you think your hubby would like to help with that? Sometimes my husband and son surprise me by showing interest and actually having an opinion about what I am creating! I really hope you will make that effort to take charge of your beads... some days it feels that is the ONLY thing I can control, and stringing a few baubles is a victory. Small victories really matter when it seems like the rest of our lives are spiraling out of our reach. Grab those beads today! Dear Dear Annette, Please do not ever feel you can't talk to any of us!! You are a part, A Very Important part of ourbeady family!!! i am very very sorry that you and your hubby are in so much pain and are feeling so overwhelmed!!!! Please know that you and your hubby are always in my prayers!!! I have not been where you are in a very long time. I won't tell you how to get out but I will tell you that you can get out!!! Please know that I will pray for your strength and comfort and peace of mind!!! I will be here if you need me for anything that I can help with!!!! Pm me if you want!!! I will answer asap!